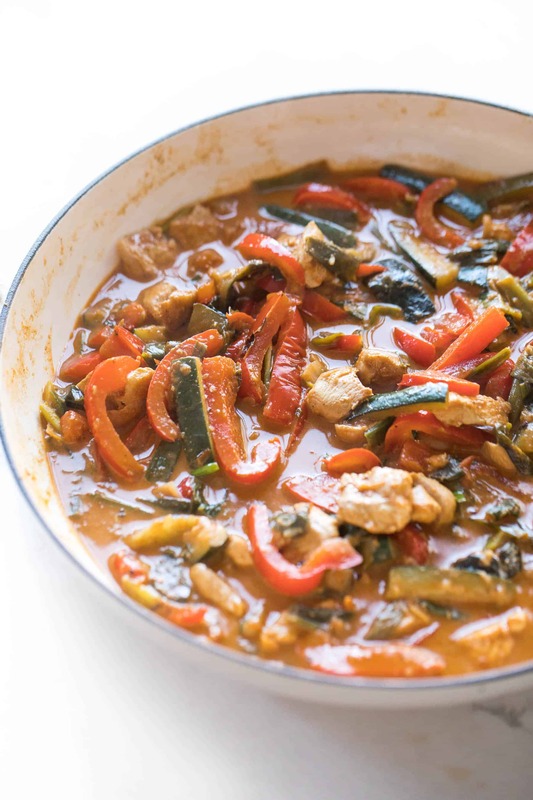 Paleo + Whole30 Coconut Chicken Thai Curry Recipe + Video – a flavorful & healthy keto chicken and vegetable thai curry recipe. Ready in under 30 minutes! Gluten free, grain free, dairy free, sugar free, clean eating, real food. Welcome Whole30 friends! I have lots of delicious Whole30 dinner recipes that will make this 30 day clean eating reset fun and delicious! I love Thai curry. The warm spices. The slight kick of heat. The sweet coconut milk. The juicy chicken and tender vegetables. It’s just the best! 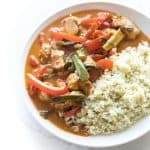 I used to get coconut Thai curry exclusively at restaurants, until one day I decided to make it myself and was blown away by how easy it was. It was just as delicious, and by making it at home I can control the ingredients to ensure it’s paleo + Whole30 compliant! First, you need some chopped vegetables. Any vegetables will do! I tend to like it with zucchini, bell pepper, green onions and yellow onion. I’ve also made it with broccoli, cauliflower, spinach, shredded carrots, celery, potatoes, etc. Next, you need chicken. I love using thighs or breasts. It cooks fastest if you cut it up first before adding it to the pan. For the sauce you need red thai curry paste and coconut milk. There’s a lot of coconut milk options, so make sure you getting the right one! Use canned full fat coconut milk, or even coconut cream. Those links take you to my favorite ones. I personally don’t like canned light coconut milk, but that works too if it’s what you have and prefer. In case you’re new to buying coconut milk, you DON’T want to use the coconut milk that is in the refrigerated section next to almond milk because it’s too watered down. And NOT coconut creamer that is next to the coffee creamers because that is meant for your coffee. And NOT canned cream of coconut (aka crema de coco) because it is super sweet and meat for daiquiris and desserts. 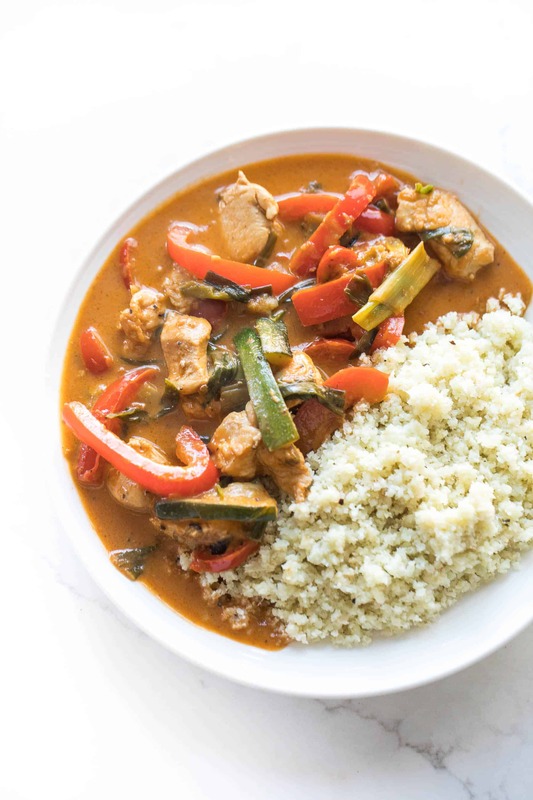 I love serving the thai curry over cauliflower rice, or regular rice if it works for your diet. My husband loves his spicy so he tops it with tons of red pepper flakes. I like mine mild, so I don’t add any. This recipe is perfect for meal prep as a lunch or dinner. See recipe notes for meal prep instructions. With the heat still over medium high, add in all the vegetables and season with salt + pepper. Cook the vegetables until starting to brown slightly on the edges, but still crisp tender, about 6-8 minutes, stirring occasionally. Add the garlic and ginger, cook for 30 seconds until fragrant. Return the cooked chicken to the pan. Add in the thai curry paste and can of coconut milk, stir to combine. Cook for 1-2 minutes until heated thru. 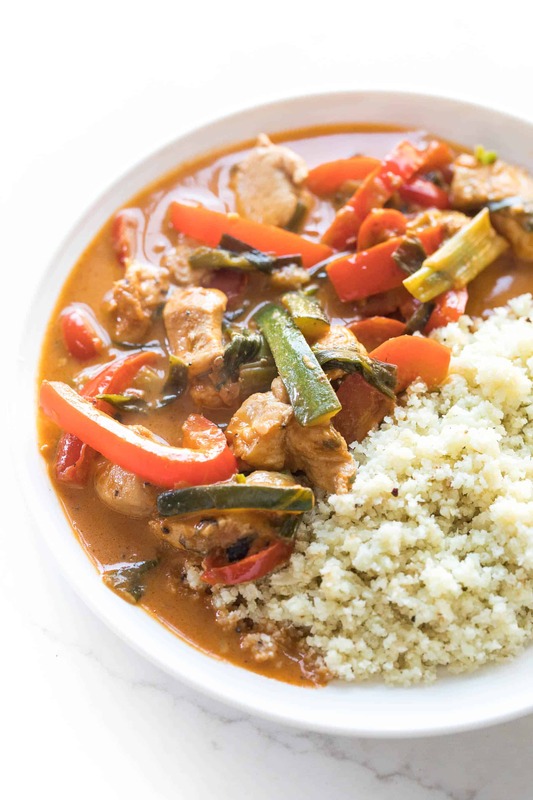 Spoon the coconut chicken thai curry over cauliflower rice (or regular rice or baked sweet potato) and serve warm. Top with desired garnishes. Meal Prep Instructions: Store in an airtight container for up to 5 days in the refrigerator. HEATING: Either microwave until warm, about 3-5 minutes, or reheat in a 350ºF oven until warm, 10-15 minutes. Oh wow. Looks so good. Coconut everything….and I’m in. This looks like the perfect meal. Yes, coconut all the things! Dish was way too sweet! Did you use use plain canned coconut milk? Make sure you didn’t accidentally grab sweetened coconut milk. This shouldn’t be sweet at all. Oh dear! It calls for coconut cream, which is just more coconut fat content than coconut milk. I get mine at Trader Joe’s, but they have it at Whole Foods also. If you can’t find it just use full fat coconut milk, or light coconut milk. Creme of coconut is a sweetened coconut milk used for drinks and baking. That would have definitely made it too sweet! Sorry you read it wrong. I hope you’ll try it again, it is DELICIOUS! I also tried this recipe and got coconut cream as it said in the recipe and it came out horrible. If you meant coconut milk you should just leave out the cream part…. Did you get coconut creamer? Like what you would put in your coffee from the refrigerator section? You want to get a can of coconut cream, which is coconut milk with a higher fat content, so it is thicker. They’re usually right next to each other at the grocery store. Thanks Liz! I’m a major curry addict too. And it’s probably smart to steer clear of samples. I always avoid samples at Costco. Those are never anything good! What a gorgeous dish, Natalie! I love the colors! I’ve never actually had thai curry, so I’m going to have to change that! I love the flavors in here. Sounds like the perfect weeknight meal! Thanks Gayle. 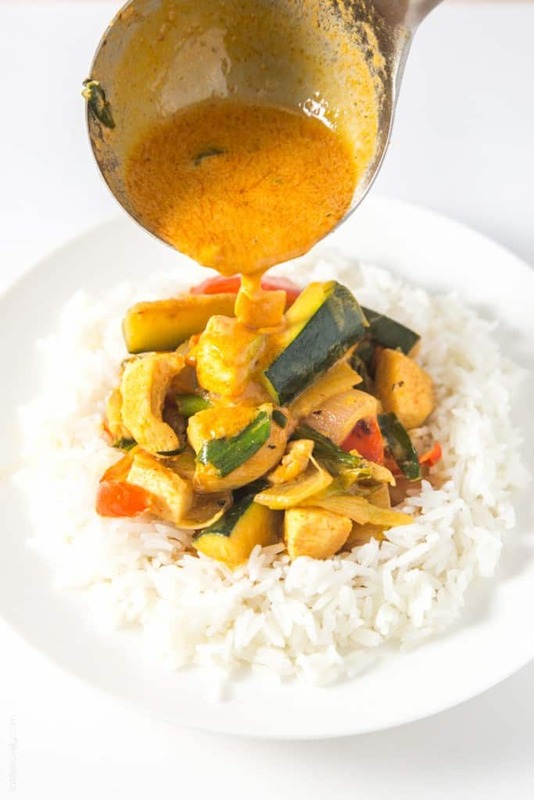 And oh my gosh, you must try thai curry! Before I had it, I assumed it would be spicy and weird. But it is SO good! Just warm spices in coconut milk. What’s not to love? Um, could our minds be any more alike?! I am currently insanely obsessed with chicken curry right now too and even have a recipe scheduled to go up in the next few weeks! Foodie buddies we are! :) This seriously looks SO amazing and is speaking straight to my curry-craving heart! Love all that veggie goodness. Great minds think alike! Can’t wait to see your recipe. I seriously make curry a few times a month, and am always looking for fun variations to mix things up. My husband would be allllll over this, and it looks mighty tasty to me, too! I love curry and we actually got a wok as a wedding gift, too. Spencer just broke it out last weekend, and we’ve already used it twice since then! He was so funny with having to “season it” and do all this crazy stuff. I was kind of amazed, actually. Will have to get this on the menu for us! Girl, this put a smile on my face this morning! I loooove Thai Chicken Curry! I’ve been trying to develop a recipe myself but I love how simple yours is. Can’t wait to try it! Pinning! This curry looks so creamy and delicious! I love the color of the sauce – it looks so flavorful. And I love that it only takes 30 minutes to make. Can’t wait to try this! I’m a huge curry fan and this looks great Natalie! I have a shrimp curry and salmon curry up on my blog. So, I’m totally on board with this chicken version! I love all the veggies you used. Can’t wait to try it! We went out to dinner a few weeks ago, and I ordered shrimp curry. So great with seafood! I’m going to have to try your salmon curry next. That will be a fun way to mix things up. Thanks Keri! This looks amazingly delicious, Natalie! I adore curry too, and yours looks fabulous. I just saw a recipe for coconut rice on Kitchen Treaty and I want to make this and that and devour all the coconutty curry yumminess. Totally agreed about Trader Joe’s having the best samples! Oooh, I’ve served this with coconut rice before. So good! My real favorite is cooking the rice in coconut water. Still leaves you a light and fluffy rice, but flavored with coconut. Yum! We love curry! I love how flavorful that sauce looks – perfect for warming up on a cold night! I love finding new ways to make and prepare curry. The sauce is such a pretty color too! Thanks Shelby! It is a pretty color. Except for when I drip it on my white shirt, haha! And thank you SO much for the compliments on the video! They’re a little (a lot!) more work, but Shawn films them and edits them for me so I have lots of help. I think they’re great for novice cooks, or people who need a lot of reassurance on how a recipe should look during the cooking process. You’re so nice Mariah! I love the samples at Trader Joe’s but I equally love when they’re cooking and giving away samples at Whole Foods. Tonight they were sampling sword fish and it was out of this world amazing. I’m a huge curry fan myself. This dish looks very good and I can just tell by looking at the sauce that it’s amazingly flavorful. I’ve discovered so many delicious foods from the Trader Joe’s sample table. I need to hit up Whole Foods more, can’t believe they were giving out samples of Swordfish! You should give this recipe a try Marcie! So easy to throw together, and tastes amazing! Just as good as Thai takeout. Natalie, I am soooo impressed by this recipe!! Curries are not easy to do! I can’t wait to try this!!! and hahah, I love the food samples at TJ’s. . I will always buy whatever they are sampling. . I’m such a sucker like that! :P love this!!!! I’m thinking I can use this sauce in like a MILLION things, bc it looks straight up incredible. Yums Nat! When we were in Maui there was a restaurant downtown giving away free pizza samples! My husband was in heaven :) I’ve never made any kind of curry before but I always love to order it out. For some reason I’ve been a little scared to make it on my own! This looks so good and so healthy which is a big plus! Coconut chicken curry is my favorite! I try to make it a few times a month. Love red curry paste! Free samples are the BEST. I’ve only had curry once, but I’m surprised how much I liked it! This looks super good! I LOVE thai curry! When I was in Thailand I must have eaten it every single day! Your version looks just perfect, so creamy and all those veggies in there= super healthy too! Oh man… I can’t go shopping at Costco when I’m hungry because I just want to eat ALL THE FREE SAMPLES! Lol! My TJ’s doesn’t seem to have them that often, but I agree they do have the best fun foods! I love coconut curries… so delicious… and so great for using up whatever veggies you happen to have! Free samples are the best! Like a little appetizer to enjoy while you shop. Thanks Jess! I am so happy to hear that Brandy! I love this recipe. So quick and easy and DELICIOUS! Impressed your 8 year old is eating curry. I didn’t have curry until I was in my 20’s. Sounds like you’ve got a good eater on your hands. Thank you for taking the time to let me know you liked my recipe. You just made my day! Just walked in from work after a 12 hour day on a Thursday night and this is what I’m making, again! We did this on our second whole30 and now it’s in the weekly rotation. So fast, so easy, so good! Just made this recipe exactly as written and it is DELICIOUS!! My husband and I love curries as they are a great way to pack in lots of veggies. 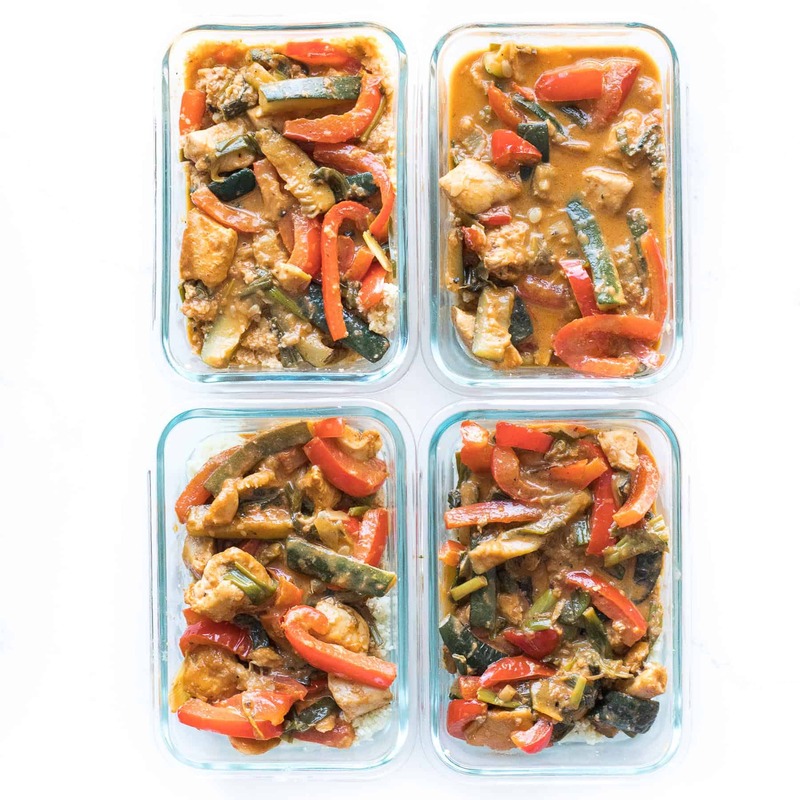 I found this recipe (and your wonderful site) by googling “paleo Thai curry” – and I’m so glad I did. Thank you! I am so happy to hear that Jessica! This recipe is perfect for Whole30 or Paleo. We did Whole30 last January, and I made this curry once a week with cauliflower rice. So good! I love how easy it is to throw together, and you’re right, it is a great way to pack in a ton of vegetables. Thank you for taking the time to let me know you liked my recipe! You just made my day! Hugs! Hi. I am making this tonight and hope it comes out good, it looks delicious! 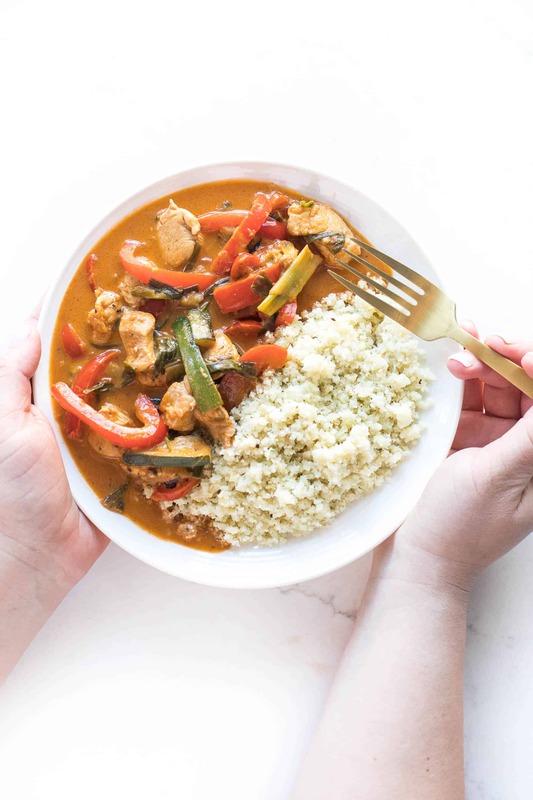 I just didn’t know if you know that in the beginning of your post when you describe the dish, it has the ingredient Thai Curry Paste, but in the ingredient list it references Thai Sweet Chili Paste, which is definitely NOT Whole30 compliant. I had to go back and read it a bunch of times to figure it out! Just wanted to give you a heads up. Oh my gosh, you are so right Susan! Thank you so much for catching that! I went in and fixed it and changed it to Thai Curry Paste. You are so sweet to tell me! That would have made this taste WAY different! Haha! So glad you liked it too. It’s one of my favorites. And perfect for Whole30! Big hugs to you! Holy Smokes! I just made this for day 3 of my Whole30. It was flipflopping delicious! I’m actually happy that it ended up too spicy for my kids because that way I didn’t have to share. I am so looking forward to leftovers! I’m so happy to hear that Sara! It was a lifesaver for me during Whole30. Tasted like a totally indulgent dinner, but healthy! I still make it all the time. Haha, and love that you have leftovers for yourself! You can totally adjust the amount of thai curry paste you add to make it more kid friendly too. I use Thai Kitchen red curry and don’t find it too spicy at all. Sometimes I add even more than I have written in this recipe if I want more of a kick. And my husband really likes spice so he’ll sprinkle on red pepper flakes for extra kick on his. Thanks for taking the time to let me know you love my recipe! You just made my day! Hugs! 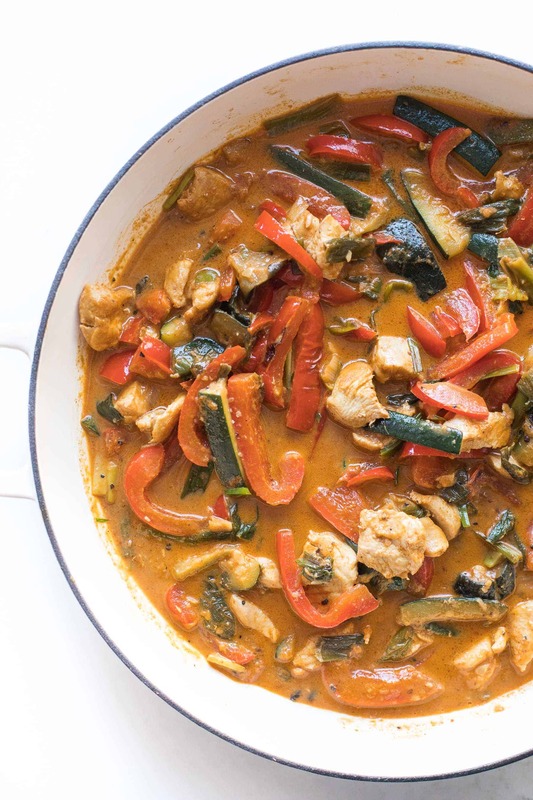 This is the best Thai curry recipe I’ve ever tried. Tastes like the one from my favorite restaurant, except I KNOW it’s healthy and all that goes into it. For anyone who likes it, I also add pineapple chunks to the veggie mixture and it creates a really nice sweet/savory balance! I also top with cilantro. Thanks so much…this is a weekly staple in our house! Kristen! You are TOO NICE! I actually like this way more than any curry I can get in a restaurant for the same reason, I know everything that is in it. And I love your idea of adding pineapple! What a great idea! And cilantro too. Mmm, the more flavor the better. Thanks for taking the time to let me know you liked my recipe. You made my day! Really loved this. 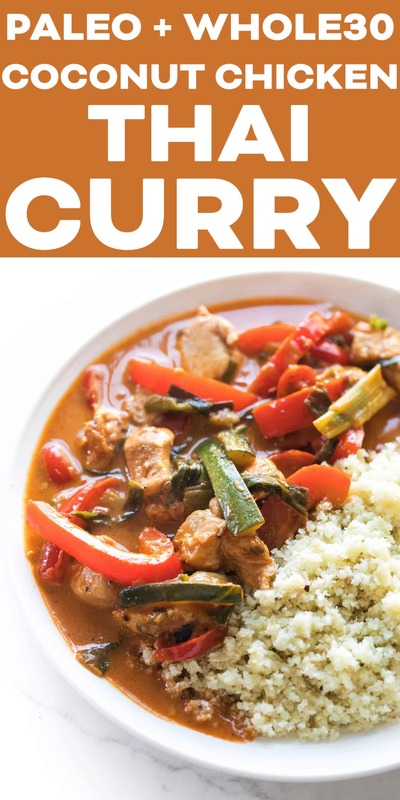 I LOVE curry and try a lot of different recipes, and this was a favorite-and so simple! Yea! That makes me so happy Heather! I seriously make this twice a month. Sometimes with chicken, sometimes with shrimp, sometimes with just all veggies. Great quick and delicious dinner. Thanks for taking the time to let me know you liked my recipe. Big hugs to you! This was delicious! I opted to have mine over zoodles (I cut back to only 1 zucchini in the recipe). The flavors were perfect! Thanks! Oooh, love the idea of having it over zoodles! Will save you a ton of carbs, and still keep it paleo/whole 30. Glad you liked it Caitlin! Thanks for letting me know! Yea! He loved it! Haha! I love that Samantha. It is such a favorite in our house. I seriously make it twice a month. Love your idea of adding cashews and coconut sugar! Mmm! I’m going to try that next time. Thanks for letting me know you liked my recipe. You made my day! I made this for dinner last night. I didn’t have any zucchini so I used broccoli instead. It was delicious! My husband and I both loved it. I’ve tried curry before and have NEVER had success, but this one is easy and so tasty! I’m so glad you and your husband liked it Melanie! And smart using broccoli instead of zucchini. I’m going to try that next time! I had so many curry fails until I finally perfected this version. The one that was just curry powder and milk on top of veggies was particularly gross. Thanks for letting me know you liked my recipe! Made my day! I’m so happy to hear that you liked my recipe Jamie! When I make this with lite coconut milk, I only put in about 2/3 of the can, since the lite coconut milk is thinner than coconut cream. Otherwise, I use the thick coconut cream that I get at Trader Joe’s. Hope next time with your tweaks it’s even better and to your liking! Thanks for taking the time to let me know that you liked recipe. You made my day! Hello! I was wondering if you had an estimated calorie or nutritional count? I’m currently tracking that and I’m more than willing to enter everything in, but I wanted to see if you had that information first. Hi Kady! I actually don’t give calorie estimates anymore because it can vary depending on the exact ingredients you use. But when I calculate calories I love caloriecount.com! Hope you love this recipe when you try it. It is such a favorite in our house. WOW, just wow. This dish is AMAZING! One of the best dishes I have ever made/had and it is now my husband’s favorite. Thanks for the share! This was amazing. I’m on Day 7 of my Whole 30. We tweaked the recipe a bit based on our tastes and pantry. I used coconut milk (not coconut cream), carrots instead of zucchini, and Madras curry powder. I also added a diced jalapeño without seeds and some fresh cilantro. My husband couldn’t stop raving. Thank you for your delicious recipe! I’m so happy to hear that Wendy! I love that you added diced jalapeno and cilantro, I’m going to try that next time! I made this in a jiffy on a busy weekday, and OH MY goodness, how delicious! I tweaked it a little bit based on what I had on hand. Made it paleo for me (put it over roasted cauliflower cut up in very small pieces) and over rice for my family. The ultimate compliment, I think, was my 11 year old son LOVED it! He said he wants this meal on our regular dinners list. YESSSS! Thanks so much for this winner! I used this as inspiration to jazz up an old recipe I used to make that also has cashews and then opted to make sweet potato noodles instead of using rice! It was delcious, my boyfriend could not get enough! Does this freeze well? I’m starting Whole30 in January and planning on making big batches of meals to freeze for later in the month. I just made this and what a delicious and simple recipe! The entire family loved it. Will definitely be making it again. So glad you liked it Sumer! Finally a recipe to replace all the Thai curry take out we’ve been ordering lately! Loved the recipe and is our new go-to using whatever veggies we have on hand. Thanks!! Yea! So glad you liked it Michelle! We make this all the time. So delicious and healthy! Thanks for letting me know, made my day! I started a Paleo diet and was searching for a good curry recipe. This was it!! Wow, this was like something you would buy from a restaurant. My son who turns his nose up at curry was dipping into the sauce. I think this could be used for other meat than just chicken and still taste wonderful. Thank you so much for sharing this delicious recipe. I will definitely make again. My only change: I used onion, carrots and broccoli for my vegies as that was all I had on hand. Yummy. I’m so glad you liked it Jennie! We make this once or twice a month. So good! Whole family loved this! Thank you! Served it with cauliflower rice. Can’t wait for leftovers tomorrow! Hurray! So glad to hear it Janine! I am obsessed with this! The recipe is perfect. I double it and add a little extra curry paste for more heat. I did use ground ginger and it worked fine. Also, this dish freezes very well. I put the jasmine rice in the bowl last (on top of the sauce) before freezing. Just mix it all together once defrosted and ready to eat. I seriously cannot get enough of this dish! Yea! I’m so glad you like it Mindy! I love it too! So flavorful and so healthy. And yes, more curry paste with definitely add more heat. My husband adds on SO much red pepper flakes because he is a spice lover. And I’ve got to try freezing it! So good to know it worked well. Thanks for letting me know you liked my recipe, you made my day! Thanks for the easy to follow recipe! It tasted great! I thought it was very similar to Surin just not as sweet 😉. I’m so glad you liked it Caley! Thanks for taking the time to let me know you liked my recipe, this made my day! Very good recipe but my family likes it more soupy. Used 3 cans coconut milk, 6 tbsp of curry, doubled the vegetables and added 2 red peppers cut in strips and half of a pineapple cut into chunks. So glad you and your family liked it Ken! Adding more coconut milk is the way to go if you like it more soupy. I want to try adding pineapple next time! Sounds delicious! Thank you so, so, so much for posting this recipe. I’m on day 4 of whole 30 and was already getting so bored of everything. I finally feel like I ate a decent meal and I LOVE it. I couldn’t even hardly wait until 10:30 am to eat the leftover. Thanks again! I’m so glad you liked it Olivia! It is such a favorite in our house. Such great flavor. Thanks for letting me know you liked my recipe, you made my day! This was delicious! Since I love yellow curry I used half red curry paste & half dry yellow curry. We also topped it with peanuts, coconut & golden raisins, as those always go good with curry. I will make it again! I love that you topped it with peanuts and golden raisins. I’m trying that next time! So glad you liked it Mary Jane! Thanks for letting me know you liked my recipe, you made my day! I really enjoyed this recipe. I added about a Tablespoon of curry powder (to a double batch) which I think added to the flavor. Otherwise I made it (doubled) pretty much as written. I didnt end up using 2 whole cans of coconut cream, more like 1 and 1/2, even though it was doubled. It was a hit with all my guests (but not my small children who I can’t yet convince to enjoy curry!). I love all the vegetables and will make this again!! Thank you! I’m so glad you liked it Kathryn! I love that you added a tablespoon of curry powder. I want to try that next time. So happy you nad your guests all enjoyed it! The ultimate compliment! Thanks for taking the time to let me know you liked my recipe, you made my day! This is a great and simple recipe! I added just a little brown sugar and lime juice at the end to give it a little sweetness… can’t wait for leftovers tomorrow! I’m so glad you enjoyed it! Thanks Kailee! Your add ins sound delicious. Hope it made for a great lunch the next day too! This was wonderful! I’ve been hunting for a curry recipe and can stop- this is it! Thanks again!